It continues to amaze me what gets donated to local charities (particularly in California!) 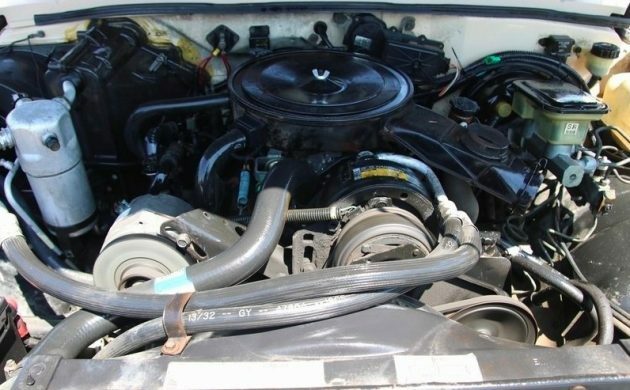 This 1985 Chevy S10 pickup is a desirable configuration, with the extended cab and a 2.8L V6 paired to a manual transmission. The odometer shows 13,742 miles, and while always iffy in terms of validating, the cosmetics seem good enough to belong on a low-mileage specimen. It’s selling at no reserve, too. Find it here on eBay where bidding is just under $500. The seller says there are some isolated dings and scratches, but if there are, they aren’t that significant. 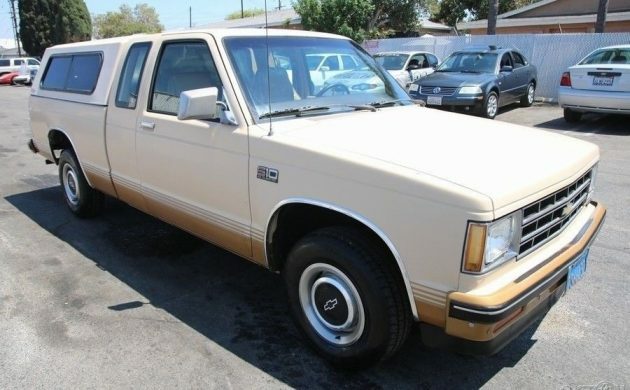 The colors are about as uninspiring as they can get, which potentially could limit the S10’s curb appeal. The rear bumper may have been tapped at one point, as it’s just starting to sag; steel wheels with black hubcaps are as basic as it gets, so the first owner clearly wanted a utilitarian rig but not without features like the extended cab, V6, and air conditioning. On that last note, the A/C currently doesn’t work. The seller also says it needs a new headliner and battery, but they have road-tested the car and found it to run/drive without issue. 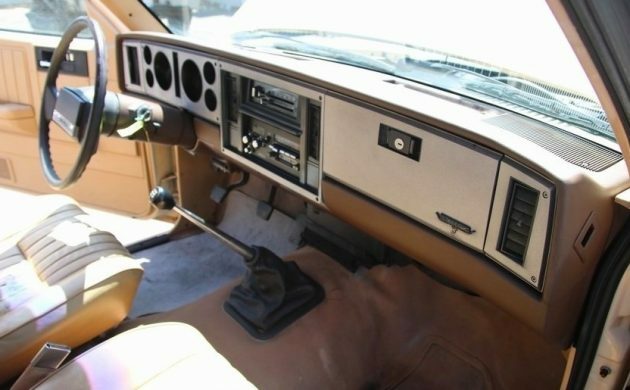 The interior similarly appears to be in nicely preserved condition, and the lack of dash cracks seems to confirm that this S10 was stored indoors for many years before being picked up as a charitable donation. The long-throw shifter is how truck transmission sticks should always look, in my opinion. Even the hoses still appear fresh under the hood, and black plastics still show off nice luster. 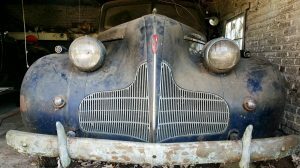 The seller doesn’t detail any sort of maintenance history, but I have to believe a truck this well-preserved was treated to regular and frequent dealer servicing. The gallery photos show a bed with some signs of use, and rear jump seats that apparently didn’t see many passengers. 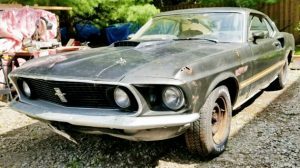 This thing is going cheap and someone’s going to head home with a very usable daily and/or work truck. Very nice little rig. I like the boring colors on this one. One of the S-10’s I had was this exact truck, topper and everything. It had the 2.8 and had a TON of miles. I doubt it was original motor, but was told, 2.8’s needed meticulous oil changes, like every 2500 miles. I used it for a small package delivery truck, and it worked well. I don’t think the site is saying it has 13K original. This is a donated vehicle with a 5 digit odometer so they post what it is reading. 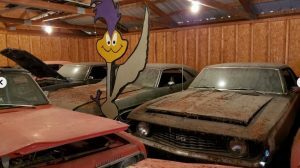 It’s good to see another one of these donated cars featured on this site. 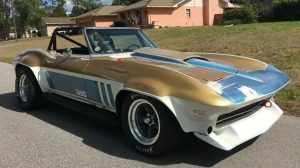 This seller seems to process some interesting cars. If I were local I would pay their website a visit on a daily basis. Very clean high mileage truck. Looked at other items for sale and they show a much heavier use of silicone spray before pix. 100,000 mi. at least! Yay, 6 digit odometers! If it stays in a rust free environment there’s a lot of years of life’s left in it. I had a black standard cab with the exact same color stripes and engine/ transmission combo that I drove back and forth from WNY to college (in Florida). Mine also had vinyl seats and no AC…memories. The reason you see lots of these in California is because of their ridiculous strict environmental rules/laws. Lots of very nice vehicles can’t be registered there because of them, which is somewhat counterproductive as it means lots of vehicles get scrapped for no good reason except they can’t meet some arbitrary number on the test. Having said that, even though I am a Ford guy this is a really nice little truck..
For the price, it’s a very nice truck! I am not a GM fan in the least! However my son has a S 10 except 4 wheel drive, I use it every winter! It’s the last year of the S 10, it’s got over 200,000 miles on it! Same engine as this one has it still drivers like new and doesn’t consume any oil at all! So I am convinced that these engines are definitely bullet proof! You are convinced they are bullet proof because you had one that worked? You should take the word of somebody that worked for Chevy when they were new and also bought and sold many of them used. They were not bullet proof. Nice little truck! Should make somebody a nice daily driver. Get it out of California to the real world, change the motor if it goes away and put it back to good use. I picked up a ’01 s10 with some ck engine light problems and gave it to my son for his first car. Good transportation and was a very good driver training vehicle. These have enough but not too much power for a new driver. Good luck to the new owner. 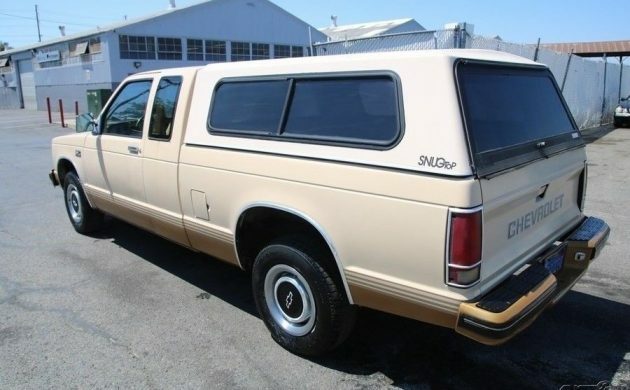 I had an 83 GMC S-15 that was equipped with the 2.8, manual trans, a/c, and a bucnh of other options. It was originally sold in Sedona, AZ but made its way to SE PA in the early 90s. I bought it and absolutely loved it but Pa road salt quickly attacked it and dissolved the body. In less than 5 years it had holes and blisters everywhere. I’d LOVE another primitive little truck like this, especially with the extended cab, whether it has 13k or 113k miles. But I don’t feel like shipping a 33 YO truck from CA, sight unseen. Find one with the 4.3L. You will be way ahead. It’s gonna sound like I am stupid, but trust me I am not I just don’t pay much attention to GM vehicles! Is the 4.3 a 6? If so that might be what is in my sons truck! I just assumed that it was the 3.8! They say the 4.3L is a 305 with the back 2 cylinders hacked off, so it is a proven engine. Nope. The 4.3L is a 350 with two cylinders left off. 4.00 inch bore X 3.48 inch stroke. Read the top of the page carefully…. When a vehicle is no longer available (sold, or ad deleted), eBay points the page to a similar ad. 2.8 is a small V6 4.3 is a bigger v6 and a better all around engine.